What is an Canadian Canoe? Open canadian canoes are a large open boat with two to three seats in them and bouyancy tanks at either end. Canoeing is an activity given to us by the American Indians, open canadian canoeing is a great way to explore the rivers, lakes and waterways. Rafting two canoes together makes a really stable craft which is almost impossible to turn over unless you really tried hard! Using a specially designed sailing rig enables you to incorperate sailing into your canoe experience. 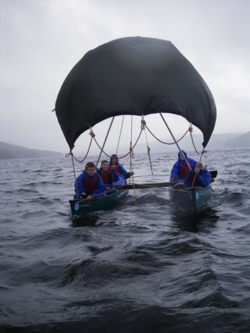 Your group will help rig the A - frames and ropes which the sail will be hoisted up. Its a little different than conventional sailing, more like a Viking long boat than a sailing boat. There will always be some paddling involved to get into the best possition to catch the wind but once we catch it, it's time to just sit back and let the wind do the work. Our sailing days are great as a full day option incorporating open fire cooking or a BBQ lunch, the Lakes are full of islands and bays to explore and open canoes are the best way to do this. 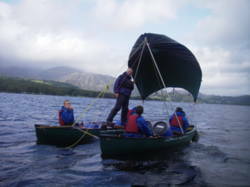 We have many canoeing and kayaking venues in and around Lancashire and Cumbria in particularly around the North Lake District, South Lake District, East Lake District and the West Lake District areas, for example Coniston, Ambleside, Windermere, Keswick, Hawkshead, Kendal, Bowness, Ullswater and Preston, to name just a few. are using Mad River explorer canoes for their canoeing sessions and as transport during canoeing expeditions and wilderness canoe camps. 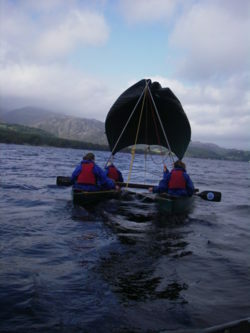 To view some of our open canoe saing pictures please click here Canoeing images. If its equipment and sales your after we are happy to help and advise you on the best places to buy canoes and canoeing equipment. Look out at the end of the 2009 season when we will have our 12 Mad River explorers for sale. These canoes are great value for money and include "cheeses" a popular hard waring floatation / boat bouyancy device. Please feel free to call us for further details.